Impress your friends with knowledge of all things American?geography, history, entertainment, people, culture, and quirky miscellany. More than 3,000 questions will fill countless hours of fun as you learn fascinating facts about our country. Now with facts and trivia related to the American flag and ?The Star-Spangled Banner,? 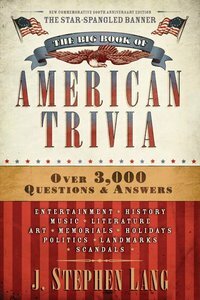 The Big Book of American Trivia has hours of fun packed within its pages. Perfect for party games, family gatherings, and vacations. About "The Big Book of American Trivia"
J. Stephen Lang is a bestselling author who has written more than 30 books, with more than 1.7 million copies soldincluding The Complete Book of Bible Trivia and 1,001 Things You Always Wanted to Know About the Bible. He is a regular contributor to Discipleship Journal, Todays Christian, and other magazines. Stephen holds degrees in religion and communication.